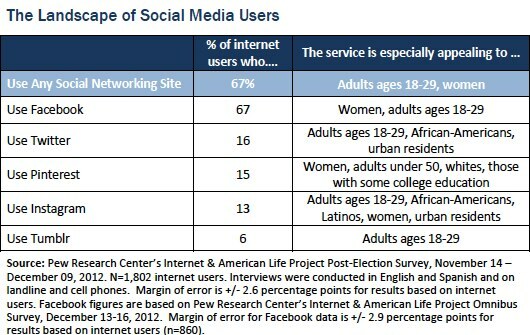 A late 2012 survey by the Pew Research Center’s Internet & American Life Project shows that young adults are more likely than others to use major social media. At the same time, other groups are interested in different sites and services. In the case of Pinterest, Instagram, and Tumblr, these are the first reportable survey readings by Pew Research allowing comparison of whites, African-Americans, and Latinos. These readings come from a national survey conducted between November 14 and December 9, 2012 on landline and cell phones and in English and in Spanish. The results reported here come from the 1,802 respondents who are internet users and the margin of error is +/- 2.6 percentage points.